After last weekend’s corned beef hash, I decided to try another classic American dish – fried chicken when I realized that I hadn’t had any in at least five years. Fried chicken along with pork chops were standard dinner fare at home and I looked forward to recreating the same comfort food we used to have when we were growing up. Since I wanted to avoid the oily deep-frying process, I started to look for a recipe that was produced the same effect as crispy-skinned fried chicken without all the oil. My sister mentioned that there was one such recipe in Amanda Hesser’s book Cooking for Mr. Latte. I had read the book several years ago and luckily, found the recipe quickly after skimming a few chapters. The recipe is somewhere in the middle of the book and is actually Amanda’s mom Judy’s recipe. It was simple and not greasy at all plus the chicken really did seem deep-fried even if they were cooked in the oven with hardly any oil. 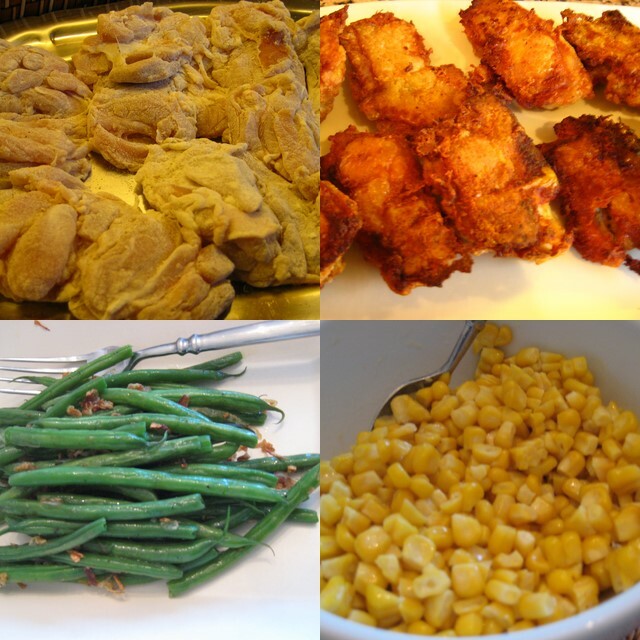 Along with the chicken, we had some fresh corn off the cob and green beans – the only thing missing for a real Southern-style meal were buttermilk biscuits. Maybe next time I’ll make some as well. In the morning, combine the 2 Tbsp. salt with about a cup of warm water in a large bowl. Stir to dissolve the salt. Trim the chicken of excess skin and fat. Add the chicken to the bowl. Cover with very cold water and a tray of ice cubes. Chill in the refrigerator until dinner time. Preheat the oven to 400F (200C). Remove the chicken from the fridge and pat dry completely with paper towels. Put the butter in a roasting pan large enough to fit the chicken in one layer. Place the pan in the oven. In a freezer bag, pour in the flour, remaining 1 Tbsp. sea salt and pepper. Give it a good shake. Add the chicken pieces tow at a time and shake them of vigorously. This is vital. You do not want a gummy coating. Line them up on a plate and repeat with the rest. Lay the chicken pieces in the roasting pan, skin side down, and oven-fry until a chestnut brown and crisp on the bottom, about 40 minutes (sometimes it takes a long as an hour). Don’t flip them until this happens. Use a thin spatula to scrape them up off the pan and turn them; cook the other side the same way. Remove the pieces from the oven as they finish cooking, and place on a plate lined with a paper towel. Just before serving, grind fresh pepper over top and sprinkle lightly with sea salt.